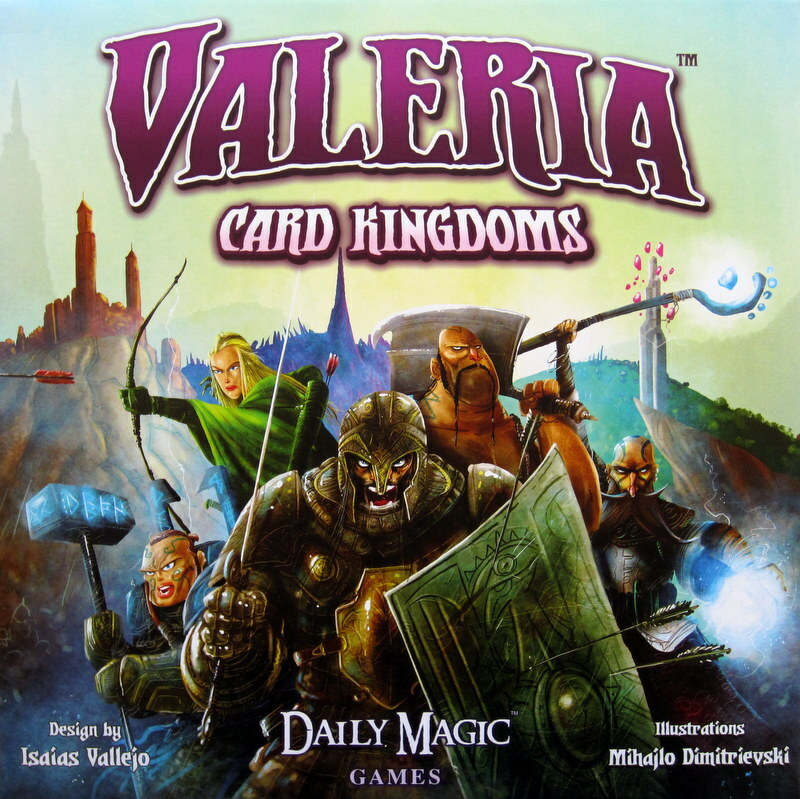 Valeria: Card Kingdoms is a game by Isaias Vallejo, published by Daily Magic Games. It is for 1-5 players. In this game, players will take on the role of Duke or Duchess of a fantasy kingdom. They will be slaying monsters, recruiting citizens an expanding their kingdom’s domain. By doing these things, they will gain influence in the form of victory points. In the end, the player that can best rule their kingdom and gain the most victory points will be declared the winner. To begin, all of the cards with the 5 player icon on them should be removed from the game. All of the cards should be sorted into their initial stacks. The play area consists of a 5 by 4 grid of cards. The Monster cards should be sorted into stacks using the area icon at the top of each one. Each stack should then be arranged face up with the lowest strength card on the top and the highest strength on the bottom. The Monster stacks should be placed in the top row of the play area with the lowest strength stack on the left and the highest strength stack on the right. It is suggested that for the first game, a certain set of cards should be used in each stack and the others returned to the box. For more information on the exact cards used, please consult the rulebook. The second and third rows in the play area consists of the Citizen cards. These cards are sorted into separate stacks by name. One type per activation number should be chosen and placed in ascending order. The remaining cards are returned to the box. For the first game, it is suggested to use certain citizen types. For more information on the exact cards used, please consult the rulebook. The bottom row in the play area consists of the Domain cards. These cards should be shuffled together. Two cards are dealt face down to each place in the bottom row. One card is then dealt face up to each stack. The remaining Domain cards are returned to the box. Two Exhausted cards per player are placed in a stack above the Monster row. The remaining Exhausted cards are returned to the box. Each player is then given a Starter Peasant and Starter Knight card. They also receive a reference card, 2 Gold tokens and a Magic token. All of the remaining tokens and multiplier tokens are placed into separate piles within reach of all players. The Duke cards are shuffled together and each player is dealt 2 cards. Each player will then select 1 of the cards to keep and return the other along with the remaining Duke cards to the box. Players should keep their Duke card secret from the other players. The first player is chosen and is given the First Player token and the dice. Play now begins. The game is played through a series of turns. Each turn is divided into 4 phases; roll phase, harvest phase, action phase and end phase. The first phase is the roll phase. In this phase the active player will roll both dice. The number on each die will activate matching Citizens in a player’s tableau during the Harvest phase. During this phase, players may use the power of any of their Domain cards. This may include changing a die. Once all players have finished, the active player announces the results of the roll, ending the phase. The next phase is the harvest phase. In this phase players check their Citizen cards to see if they match the number on either of the dice rolled. If they do, then the player will activate one of the powers on the bottom of the card. If they are the active player, then they activate the power on the left side. If they are not the active player, then the activate the power on the right side. If a player receives or pays tokens during this phase, then they are taken from or paid to the supply unless otherwise noted on the card. It should be noted that the Thief is the only Citizen card that takes from another player. This Citizen card always acts first before any other Citizens activate. If a player has no Citizens that activated during this phase, then they may take any one resource from the supply. Once all players have finished, the phase ends. The third phase is the action phase. In this phase, the active player will take 2 actions from a list of 4. Those actions are slay a monster, recruit a citizen, gain a resource and build a domain. 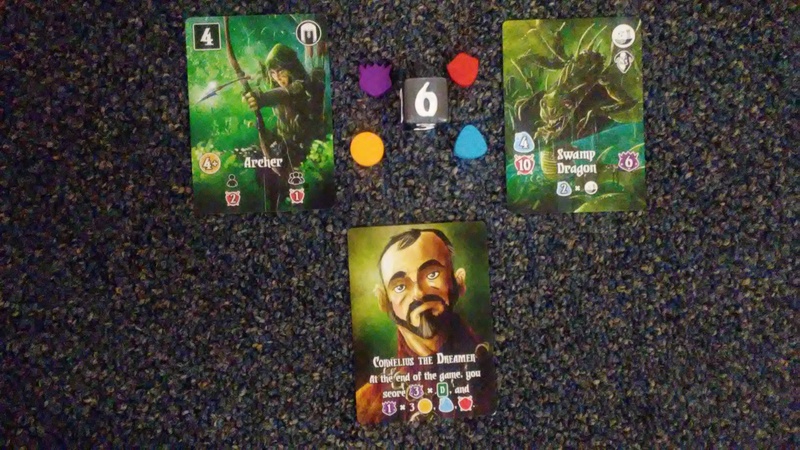 To slay a monster, the player takes a Monster card on top of one of the stacks and pays the strength and resources equal to the cost on the card. The Monster card is then placed face up in the players Victory stack, collecting any bonuses provided on the bottom of the card. To recruit a citizen, the player takes a Citizen card on top of one of the stacks and pays the resources equal to the Gold cost on the Citizen card plus 1 additional Gold for each duplicate Citizen card the player already has in their tableau. The player then places the Citizen card face up in their tableau to be activated on future rolls. It should be noted that when slaying a monster or recruiting a citizen, magic tokens may be used in place of all but one of the resources required for the card. To gain a resource, the player simply takes one of the resource tokens from the supply, adding it to their pool. That resource can be either gold, strength or a magic token. To build a domain, the player takes a Domain card from the top of a stack and adds it face up to their tableau. That is as long as the player has Citizens in their tableau that have the corresponding Citizen Role icons on them. If there are mutiple Citizen Role icons on the Domain card, then the player must have an equal number of matching Citizens in their tableau. The player must also pay the gold cost on the Domain card. It should be noted that player are also allowed to use Magic tokens in place of all but 1 of the gold tokens. Once the Domain is added, the player gains any bonuses provided by the card. The player then reveals the next Domain card in the stack by flipping it over. Once the active player has taken 2 actions, the phase ends. It should be noted that the active player is allowed to take the same action twice if they choose. Also, if a stack ever runs out of cards, the player must add an Exhausted card to the empty space. The last phase is the end phase. In this phase, the players check to see if any of the end game conditions have been met. If one of them has been, then play continues until all players have had an equal number of turns. This is noted by the turn order returning to the player with the first player token. If the end game conditions have not been met, then the active player passes the dice to the next player in turn order and a new turn begins. The game continues until the end game conditions have been met as noted above. Once this happens and all players have had an equal number of turns, the game ends. The game can end if all of the monsters have been slain, if all of the domains have been built or if the number of exhausted stacks is equal to two times the number of players. Once the game ends, players add up their victory points from slain monsters, built domains, victory point tokens and from the player’s Duke. The player with the most victory points is the winner. This game has a lot of great looking pieces to it. To begin with there are these 2 huge six sided dice that have a great looking marble style finish to them. They are almost the same size as the die in King of Tokyo. There are also several brightly colored wooden tokens for strength, gold, magic and victory points. These are really nice and look cool. I do wish they had a bit of a design on them instead of simply being plain, but wooden pieces are better than cardboard so I’m not complaining. The game also has some thick card board multiplier tokens to use with the wooden tokens. These make it where you don’t have to use as many of the wooden pieces to count tokens. There’s also a first player and resting token in cardboard as well. The game comes with some nice dividers to place all the cards into the very spacious and awesome looking insert. 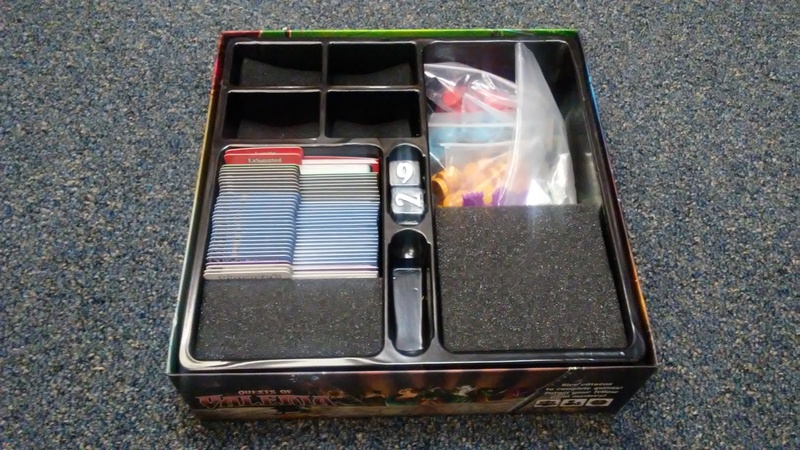 Yes, the game has a truly great looking insert inside the box. There’s plenty of room for expansions and everything fits in great. The cards are gorgeous. I love how cool the artwork is on each one. There are several different types of cards including some reference cards to help while playing the game. Needless to say, I love how cool everything looks in this game. The fantasy theme is very much a part of the look and feel. It’s truly a great looking game. The rulebook for this one is really quite nice. There are lots of great looking pictures and examples throughout the book. There are pictures of the different components and a great setup picture as well. All of the different phases of the game are explained really well. The different card types are also explained in great detail with pictures too. The rule book also includes a 5 player rule variant as well as an amazing solo variant. The rules also have a mixed citizen variant where all the citizen cards of the same activation number are shuffled together into stacks so that you never know what the next Citizen card might be. The book also has a section devoted to the clarification of several of the cards as well as a section for recommended starting setups that focus on different aspects of the game. The back cover has a quick play reference that’s very handy. It also has a section of important concepts and how to end the game. All in all, the book is very well designed. Everything looks good and is quite easy to read. I didn’t see anything that looked difficult to understand at all. Let me go right ahead and get the obvious out of the way. In a lot of ways, this plays like Machi Koro but with a fantasy theme. That said, this game really improves and adds a lot more depth to the actual game play than what is included with Machi Koro. Yes, you will be rolling dice on your turn and activating different cards. However this game you’ll have citizens that activate on the dice rolls and domains that will give you abilities that can change up the roll or do other things. You have monsters that you can kill off to gain victory points and bonuses. You have a Duke card that will help you focus your style of gameplay into certain areas to better gain more points. This game is just so much deeper and richer and I love it. I like the variations to the rules, especially the solo rules. I will say that the solo is a little bit random but is still quite a lot of fun. It has the same type of feel playing against the Dark Lord as when I play Ascension solo. That’s not a bad thing, as I like playing Ascension solo a lot. I like that as you play the monsters get harder. I also like that as you build up what I commonly refer to as your village, you get more able to do more things and fight those stronger monsters. This is not a difficult game at all and it’s one that even the kids can enjoy. The iconography does take a little bit of getting used to but after a couple of plays you’ll get it. This isn’t an overly strategic game but I think some strategy gamers will still enjoy it, especially if they like the fantasy style theme. Fans of games like Machi Koro or even deck builders like Ascension should enjoy this one, especially since the game has some similarities to Machi Koro. Overall this is a really great game that has overtaken Machi Koro in my heart. I would highly recommend it. Valeria: Card Kingdoms is a light weight fantasy themed tableau building game. It’s not a very long game. Most game sessions last around 30 minutes or so. The artwork is absolutely gorgeous. I love the look and feel of the cards and the wooden pieces that are included with the game. The game itself is really fun and has a lot of similarities with the game Machi Koro. There are several variations that allow the game to be played with as many as 5 players or few as 1. As a solo game, it has a bit of randomness much like playing Ascension solo, but it’s still a lot of fun. It’s family friendly and simple enough that everyone can play. It combines aspects of card drafting and tableau building in a fantasy realm to create a truly enjoyable game that the whole family will love. Fans of games like Machi Koro and Ascension should really enjoy this one. This is a game that I would highly recommend. Move over Machi Koro, Dad has a brand new love. For more information about this and other great games, please check out Daily Magic Games at their site. This entry was posted in Reviews and tagged board, board games, card, card games, card kingdom, daily, daily magic games, games, isaias, Isaias Vallejo, kingdom, magic, valeria, vallejo. Bookmark the permalink.